Even when my skin is behaving itself, I have a pretty constant battle with blackheads. It's probably a combination of my large nose pores (thanks genetics) and my love for fake tan, but the result is a congested area around my nose (and when it's really bad, my chin too) that I can never seem to get rid of. But recently, I've been using the newly reformulated Sunday Riley Good Genes Glycolic Acid Treatment (£85), and dare I say it: My blackhead problem seems to be shrinking. Let's rewind for a minute, though, because there's some confusion around this product. 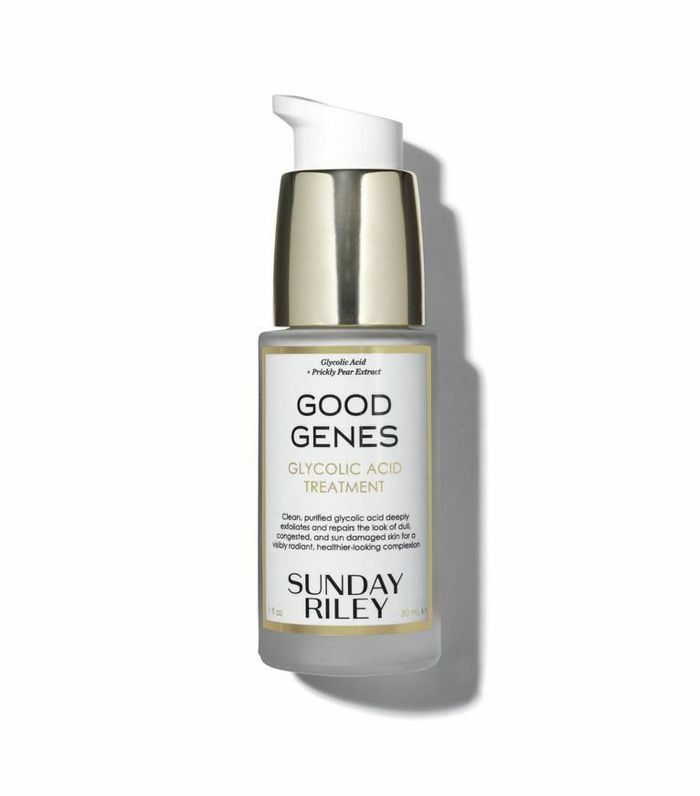 The Sunday Riley Good Genes Lactic Acid Treatment (which is still available to buy in the U.S.) was pulled from shelves in the UK at the beginning of the year due to its lactic acid content. The Scientific Committee of Consumer Safety law states that products must have a pH level greater than 5 to be sold in the UK and EU. So, Good Genes (which was previously made with lactic acid and loved by everyone from Helen Mirren to Jourdan Dunn) has now been reformulated with a different AHA: glycolic acid. But if you were a previous lover of Good Genes, chances are you'll still love the new formula. Glycolic and lactic acid work in very similar ways. Essentially, they both work to break down the upper layer of the epidermis and allow dead skin cells to be sloughed away, encouraging new, glowier skin underneath. I started applying one pump of the newly reformulated Good Genes every night to my face and neck, and in just week, I noticed a difference in my skin. As well as glycolic acid, Good Genes contains a blend of potassium lactate (a form of lactic acid salt) to exfoliate and boost the skin's natural moisturising factor. It also has lemongrass extract to brighten and clarify. The results? My skin looked glowier, more hydrated (this winter has been cruel to my complexion) and my blackheads have completely shrunk in size. One thing to note, however, is that my skin isn't sensitive but I did feel a slight tingle when I first applied the serum. It wasn't uncomfortable and I didn't experience any redness, but if your skin is more sensitive, it's worth trying a patch test first. All in all, though, I'm so happy that I rediscovered this cult serum and for me. The glycolic/lactic acid saga hasn't affected the treatment's effectiveness. So Sunday Riley (and, inadvertently, Space NK), on behalf of me and my now-shrunken pores: I thank you for bringing it back to British bathroom shelves. Blotting Powder vs. Blotting Paper: Which Works Better? This Cult-Fave Skin Product Smells Like Hot Garbage, But It's "Life-Changing"